Worldwide, depression will be the single biggest cause of disability in the next 20 years. But treatment for it has not changed much in the last three decades. In the world of psychiatry, time has apparently stood still... until now. 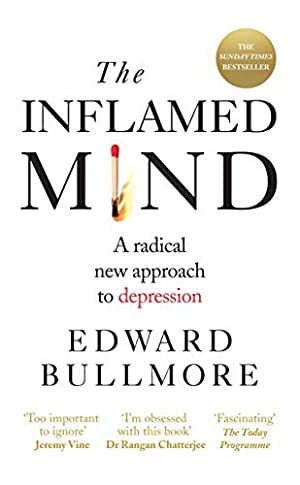 In this game-changing book, University of Cambridge Professor Edward Bullmore reveals the breakthrough new science on the link between depression and inflammation of the body and brain. He explains what we now know about how and why mental disorders can have their roots in the immune system, and outlines a future revolution in which treatments could be specifically targeted to break the vicious cycle of stress, inflammation and depression. Track It. This book has been £1.19 within the past six months. Log In to track Edward Bullmore on eReaderIQ. to be notified each time the price drops on any book by Edward Bullmore. to stop tracking Edward Bullmore. We started tracking this book on May 13, 2018. This book was £6.64 when we started tracking it. The price of this book has changed 39 times in the past 344 days. The current price of this book is £5.47 last checked 4 hours ago. This lowest price this book has been offered at in the past six months is £1.19. The lowest price to date was £1.19 last reached on March 5, 2019. The highest price to date was £6.99 last reached on August 28, 2018. This book has been £6.99 2 times since we started tracking it. We last verified the price of this book about 4 hours ago. At that time, the price was £5.47. This price is subject to change. The price displayed on the Amazon.co.uk website at the time of purchase is the price you will pay for this book. Please confirm the price before making any purchases.